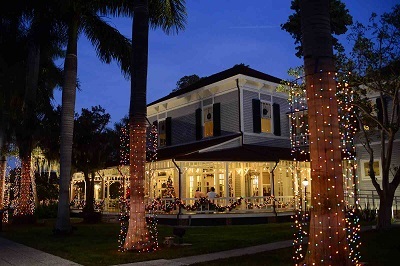 On November 25, Edison & Ford Winter Estates will kick off its 41st anniversary celebration of Holiday Nights. The winter estate homes, gardens and historic buildings of Thomas Edison and Henry Ford will be decorated with thousands of lights and decorations. This event has become a tradition in Southwest Florida and a top destination for visitors around the globe. Opening Night festivities will start at 6:00 p.m. with the annual tree lighting ceremony. New this year, will be a nightly Waltzing Waters lighted water fountain display and a special Holiday Tea with the Edisons and Fords on December 14. For children, artist Doug MacGregor will be onsite drawing cartoons on November 25, December 3 and 10, and Santa will be visiting on select nights (call for dates). Adults and children alike can enjoy the Children’s Tree Trail — a collection of more than 60 live Cedar trees decorated with handmade ornaments from Lee and Charlotte County School children. USA Today named Edison Ford as one of the 10 Best Historic Homes for the Holidays, and The American Bus Association (ABA) designated Edison Ford’s Holiday Nights as one of the Top 100 Events in North America for 2016. Thomas Edison created the first Christmas lights about a century ago and Christmas was Henry Ford’s favorite holiday, so Holiday Nights is very appropriate at their winter estate homes. The Edison Ford Museum and Botanic Research Laboratory, as well as the Ford Cottage Shoppe, Museum Store and Garden Shoppe will be open until 9:00 p.m. every night. There will also be nightly entertainment and refreshments available for purchase. Holiday Tradition Tours will be offered at 6 p.m. and 7 p.m. nightly and Inside-the-Homes Holiday Tours on November 29, and December 6, 13, 20 and 27 at 6:30 p.m.
Holiday Nights tickets for adults are $20, teens (13-19) $10, children (6-12) are $2 and Edison Ford members get in free. Guided Holiday Tradition Tours are $30 for adults, teens are $25, children $18 and $10 for Edison Ford members. Inside-the-homes tours are $50. Lee County residents will receive $5 off an adult ticket on November 25, 26 and 27, December 30 and 31 and January 1. For additional information, call 239-334-7419 or visit the website at www.EdisonFordWinterEstates.org.